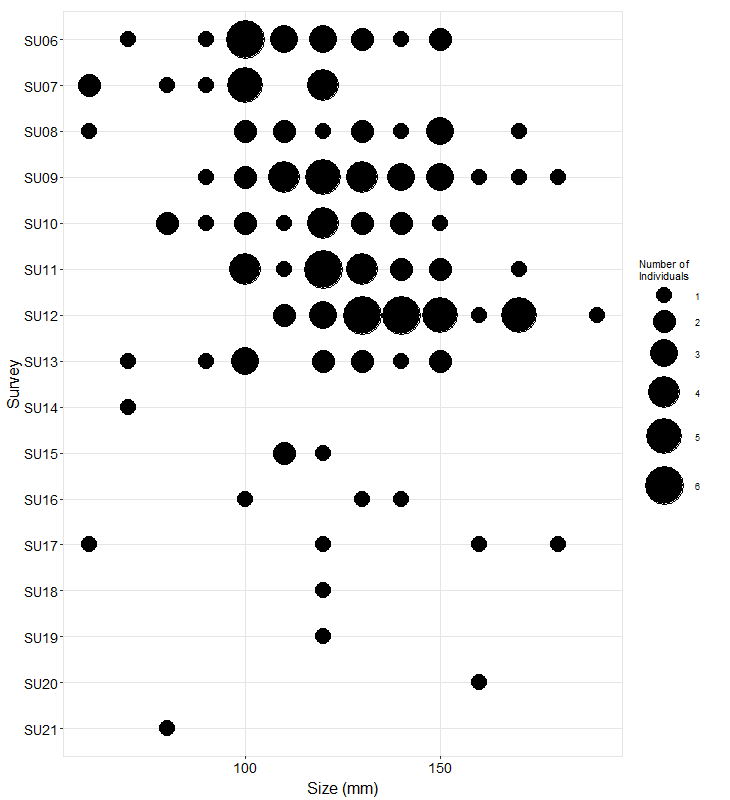 Mytilus californianus cover in mussel plots was high and rather stable at Bolinas Point, with average percent cover > 95% in 2006, 2007 and 2008 then dipping slightly to 85% in 2009 and 88% in 2010. This pattern of continuously high mussel cover is similar to that observed at Santa Maria Creek and Slide Ranch which are nearby Long-Term Monitoring sites also located in the Gulf of the Farallones. This stretch of coastline is afforded some protection from strong winter northwest swells by the Point Reyes Peninsula. This protection may contribute to the lasting integrity of the mussel beds. The numerically dominant motile invertebrates observed in mussel plots were limpets, Littorina spp., Nucella spp. and the black turban snail Tegula funebralis. Littorina abundances were quite variable with over 400 individuals per plot observed in 2007 and only 28 observed in 2008. Values were similarly low in 2009 (14 per plot) then climbing back up to 200 in 2010. Limpet counts were variable and quite low compared to the mussel plots at Santa Maria Creek which is only 8.5 nautical miles upcoast of Bolinas Point. Limpet counts at Santa Maria Creek varied between 133 and 435 animals per plot while Bolinas Point counts were an order of magnitude lower varying between 7 and 24 animals per plot. Fucus cover in Fucusplots at Bolinas Point remained fairly constant (between 36 and 58 percent cover) from 2007 through 2009 with a dip down to 28% in 2010. Mastocarpus papillatus cover was lower than Fucus but remained rather constant (between 11 and 29 percent cover). 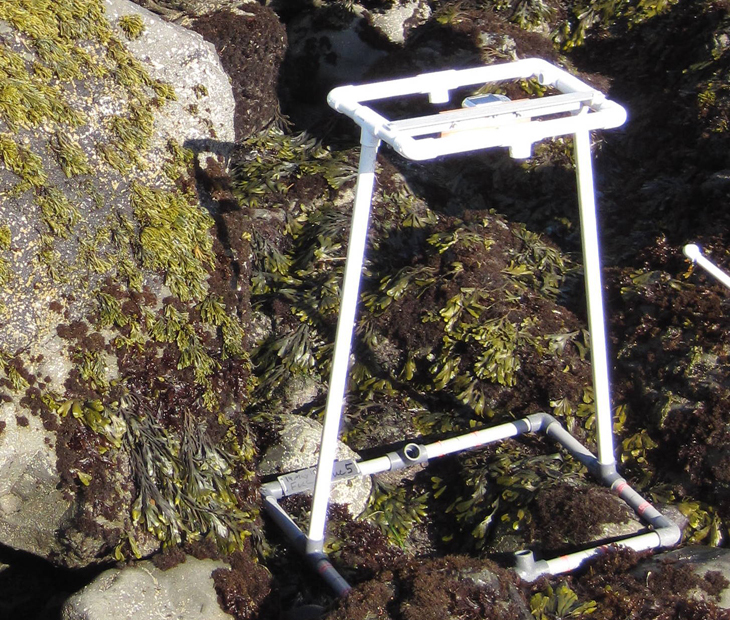 Interestingly 2010 was the lowest year for Fucus and the highest year for Mastocarpus (28 percent for both species) indicating that Mastocarpus had gained ground on Fucus.Uncolonized rock was the most common cover type in regions of the plot where algae were not observed. The most numerous motile invertebrates observed in Fucus plots were the same taxa which were observed in mussel plots, namely, limpets, Littorina spp., Nucella spp. and Tegula funebralis. Littorina numbers varied by orders of magnitude during the survey period. In 2007 427 individuals were counted per plot but in the very next year (2008) only 6.8 per year were enumerated. In 2009 Littorina counts jumped back up to 567 and in 2010 values were back down to 145 individuals per plot. Tegula funebralis abundance did not show the large fluctuations seen in Littorina with abundance slowly declining from 126 in 2007 to 50 in 2010. A fairly large number of hermit crabs (Pagurus spp.) were observed in 2008 (24 crabs per plot) a value much higher than any of the other years and the same year that Littorina numbers were extremely low. Mastocarpus cover in Mastocarpus plots at Bolinas Point underwent considerable fluctuations during the five years in which surveys were performed. Cover was 65% in 2006 and then dipped to 12% in 2007 before rebounding to 71% in 2008. Mastocarpus cover was similar in 2009 and 2010 (48% and 43% respectively). Fucus occupied a considerable amount of space in Mastocarpus plots with percent cover ranging from 4% (2006) to 27% (2009). Both Fucus and Mastocarpus had the lowest cover in 2007. Barnacles (Chthamalus, Balanus) or bare rock were most commonly seen in regions where algae were absent. A comparison of Littorina abundances in the three plot types at Bolinas Point showed that Littorina in Mastocarpus plots did not fluctuate as much as it did in Fucus and Mytilus plots. Values over the four years which were surveyed (2007 through 2010) ranged between 194 and 287 individuals per plot with no discernable long term temporal trend. Similarly, no trends were observed for the other three numerically dominant motile invertebrate taxa (limpets, Nucella spp. and Tegula funebralis). 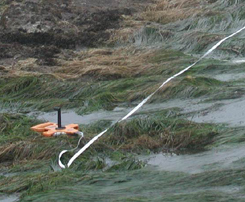 Surfgrass (Phyllospadix) cover at Bolinas Point was consistently hovering between 68% and 82% throughout the five year survey period (2006 through 2010). Pisaster (Ochre Star) numbers were relatively steady at Bolinas Point with mean counts ranging from 14 to 25 individuals per survey. 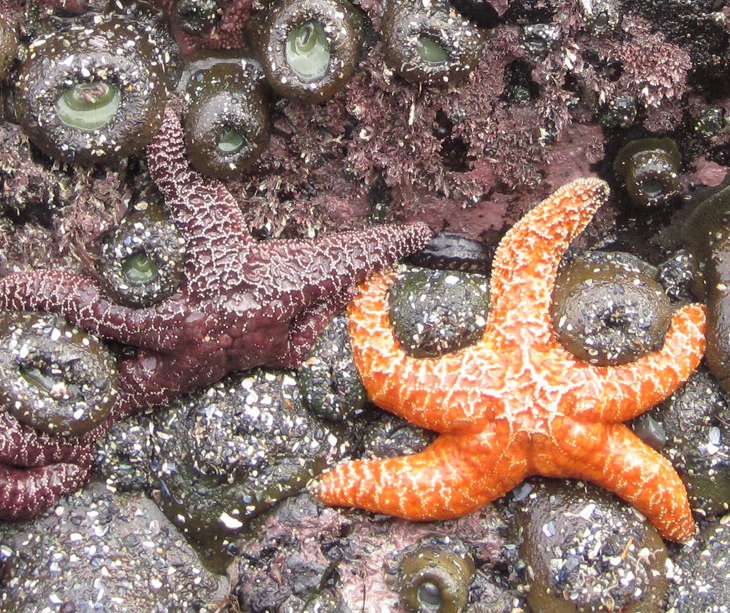 The large seastar recruitment observed at Santa Maria Creek in 2006 and 2007 was not observed at Bolinas Point as most individuals were in the adult size range.